India bound Camry will in all likelihood be similar in design to its Thai-sibling. Both trims are in line with the international-spec model in terms of looks and design. The only discernible change will be the front fascia which gets a newly designed bumper with fog lamps. The rear escapes the knife and borrows its looks completely from the international version. 7-inch multi-information display mated to the instrument cluster. 8-inch audio/navigation display with climate control panel part of the central console. 10-inch color head-up Display (HUD). The Thai-spec sedan rests on the Toyota New Global Architecture (TNGA) platform. The same platform underpins the seventh-gen Lexus ES300h, released earlier this year in India, priced at ₹ 59.13 Lakhs ( Ex-Showroom). The platform imparts increased dimensions to the new sedan, making it longer and wider by 35mm and 15mm respectively. The current Indian variant measures 4885mm x 1840mm x 1445mm (LxWxH). 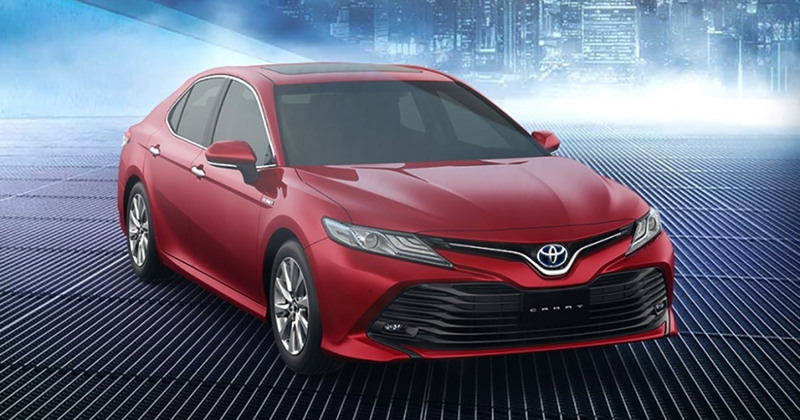 Further, with a 50mm longer wheelbase, the new Camry promises better legroom and space for passengers. In addition to these, Thai sedan lovers also get a 211PS hybrid powertrain option on the Thai-Camry. Transmission duties on the hybrid variant rest on the e-CVT gearbox which conveys the combined power output of the electric motor and 2.5 L Petrol engine to the front wheels. Indian audience may get only the hybrid trim version of the eighth-gen Camry. The 205PS powertrain on the India bound hybrid trim will have a 2.5-litre petrol engine coupled with an electric motor. The feature list on the Thai-spec Camry is at par with global standards. These include ABS with EBD, lane departure alert, traction control, blind spot monitoring, pre-collision system, nine airbags, hill launch assist, rear cross-traffic alert, and a radar-based cruise control. Other premium features on offer include automatic LED DRL, LED headlamps, LED tail lamps, 8-way adjustable ventilated front seats, reclining rear seats, a three-zone climate control, a wireless mobile charging pad, a head-up display, and a 9-speaker JBL sound system. For the India-spec Camry, we expect Toyota to offer all the above-mentioned features except the radar-based cruise control system. Upon its India Launch, the eight-gen Camry at Rs 37.22 lakh (ex-showroom Delhi) will carry a premium price tag. It will take on the likes of Honda Accord Hybrid, Skoda Superb, and the Volkswagen Passat.